I consider to have started Atkins on September 18th 2013. Weight dropped quickly up till mid-October at which point I went from 105.2kg to 97.5 for a loss of 8kg. 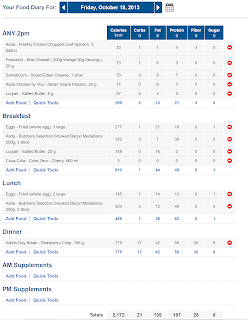 I notice not only I was very good at eating just simple stuff (Eggs & Bacon in the morning, Cheese and spinach in the evenings, not so many meatballs or up to 350gr, escalopes, and pure extra thick cream on a spoon for snacks) but also I never had my calories above 2200 calories, with the usual average being 1800, and most days food was consumed in one meal, either morning or evening (most likely evening). 24th October I tried a Carb nite with pizza and ice cream: got me to 99.5kg when I next weighted on 27th October, so about 2kilos which weren't as easy to lose again as it should be with just one night of carb loading. On 30th October I was down to 98 but it took me until the 5th of November to get back to 97.2kg. During those days my calories intake were mostly 1500 per day with still the egg&bacon and spinach combo, with some meatballs thrown in to 2200 calories tops, and anyway, not consistently. 13th of November probably due to menstrual cycle beginning on the 15th I was up to 99.6kg again. Although my daily calories intake for the week between 6th and 13th of November were all above (sometimes well above) 2000 calories per day, still keeping an average 74% fat intake over 22% protein and 4% carbs. Also, WheyHey protein ice cream was introduced on 11th November, to which I blame the weight gain. It is also the only point I stepped out of Ketosis, and again, I blame it on the WheyHey icecream. 19th of November I was 98kg, so down 1.6kg since the previous week. Menstrual cycle over, calories intake were high usually well above 2000cal with 3000+ peaks. Fat instake was on average 81%. 23th of November I hit an all time low at 95.6 (might have been too low, the day before I was 96.6kg but still) so a loss of 1.4-2.4kg in 4 days. 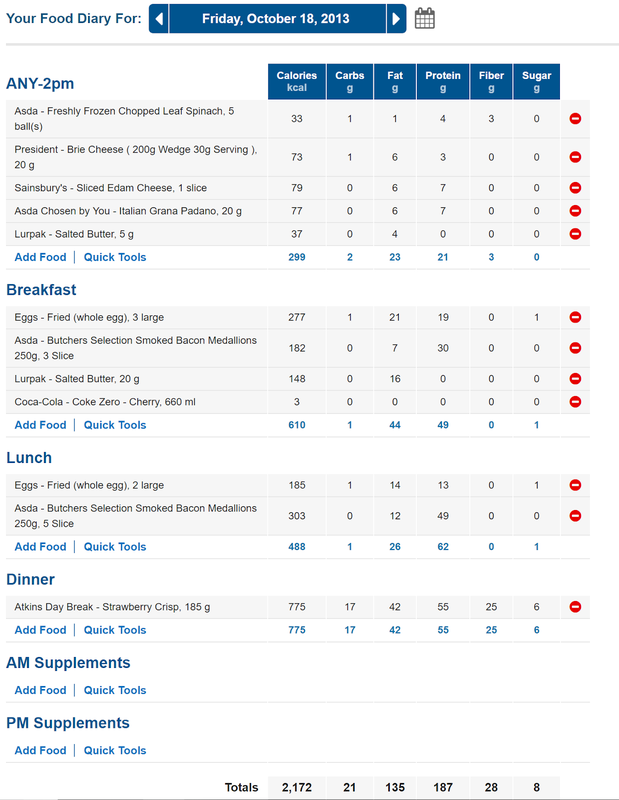 Those 4 days were all under 1800 calories per day with the 2 middle days being just around 1000, and a fat intake of 83%, mostly still with the 1 serious meal a day thing, just instead of breakfast it was usually spread during lunch/snack, with cream/peanut butter snacks. 23rd of November Davinci sugar free syrups were introduced. They claim 0 calories, 0 carbs, fat and protein, but I am beginning to consider they might have to do with weight fluctuations now, as on the label they claim to be sweetened with Splenda, which does have carbs. 28th November I tried a keto cheesecake recipe. Failure. I have the whole cake between the 28th and 29th so that on the 30th my weight is up to 96.8kg and with 2900 calories with Davinci syruped stuff on the 30th I am up to 98.6kg on 1st December. NO syrups/ice cream, even if declared sugar free.